Experience the productivity of hands-free shredding using the Stack-and-Shred 100M. Micro-cut shredder works without your supervision; just stack, shut and you're done. Auto Plus jam clearance automatically reverses and re-feeds stuck papers to clear any jam. LED light indicates rare jams that require user action. Micro-cut shredder meets high-security needs (level P-5). 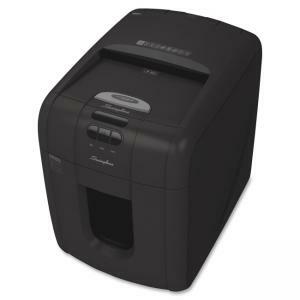 Stack up to 100 sheets for automatic shredding at home or in the office. Manual bypass handles 6 sheets of glossy, folded or crumpled paper. Shredder also shreds paper clips and staples. Maximum runtime is 15 minutes with a 10-minute cooldown. Design also includes 7-gallon waste bin with view window, 9" wide throat, stacked cutting heads and 60-decibel sound level. Self Clean feature extends cutter life.